On 26 March, representatives of the China Academy of Engineering Physics (CAEP) signed a framework collaboration agreement with European XFEL at the Consulate of the People’s Republic of China in Hamburg. The agreement formalizes CAEP’s future involvement in the X-ray free-electron laser facility and is intended to provide the basis for future exchange of staff and students and the development of instrumentation for European XFEL. CAEP is a major research centre that operates 12 research institutes and 15 national laboratories across China. In many scientific institutes across China, there is a rising interest in doing research with X-ray free-electron lasers, and CAEP looks to spearhead Chinese involvement with these facilities. "As time goes by, I hope we will be able to estimate material properties with ever decreasing uncertainties. One of the significant issues here might be the poor understanding of the phenomena at meso-scale", says CAEP Vice Director Liu Cangli. "We see a powerful XFEL, such as this one under construction in Hamburg, as being the most important tool in terms of taking on this very challenging task." 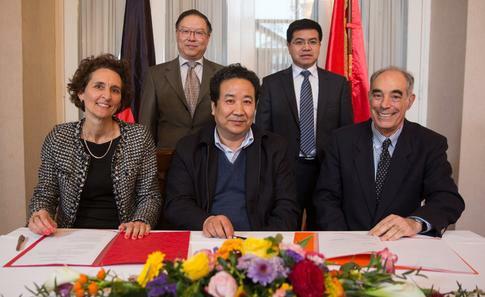 Officials at the signing ceremony at the Consulate of the People&apos;s Republic of China in Hamburg. Front row, from left: European XFEL Administrative Director Claudia Burger, CAEP Vice Director Liu Cangli, European XFEL Managing Director Massimo Altarelli. Back row, from left: Consul-General of the People&apos;s Republic of China Yang Huiqun, Counsellor Zhao Qinhua from the Department of Science and Technology of the Embassy in Berlin.